Nothing is ever perfect. There’s always room for improvement. Make every message count. Intercom is already the easiest way to track, personally communicate with, and keep your users coming back to your product for more. Anyone in your company – product, marketing, growth, and customer success – can start sending messages, to the right users, through the right medium, at exactly the right time. 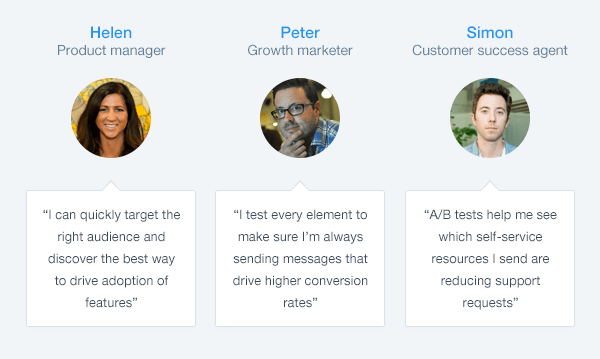 Heck, Mention increased their activation rates by 50% using Intercom’s auto messages. 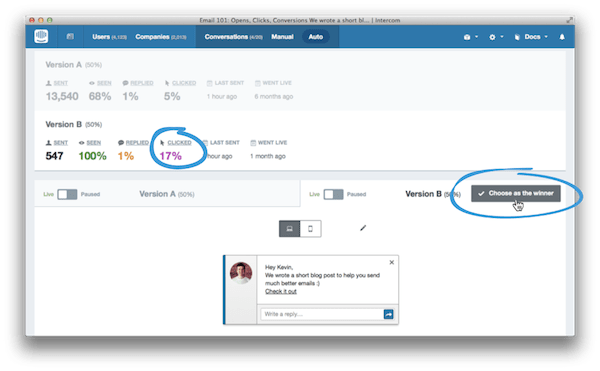 Today’s release of A/B testing for auto messages makes Intercom the easiest way to send the best messages to increase customer engagement and conversion. With your product, marketing, growth, and customer success teams empowered to send exactly what they want, to who they want, when they want, comes great responsibility – responsibility to send the best messages to your users. You want to be sending messages that will help users discover useful new features when they need them most. Messages that give users a direct line to provide you with valuable and timely product feedback. Messages that will help users get the absolute most utility out of your product or service. Messages that will help you build lasting relationships with your users and keep them coming back for more. Is an in-app message going to drive more goal conversions than an email? Which subject line will get more users to open my email? Will a button generate more click-throughs than a text link? As Des so accurately put it in his post, Email 101: Opens, clicks, conversions, a badly-written email is about as effective as a love letter addressed “To whom it may concern”. Take his advice, and start fine-tuning your auto messages in Intercom to increase customer engagement and conversion. Find the optimal medium, subject, and content. If you’re not sure what message or medium will drive the optimal action amongst your target users, it’s always best to test. 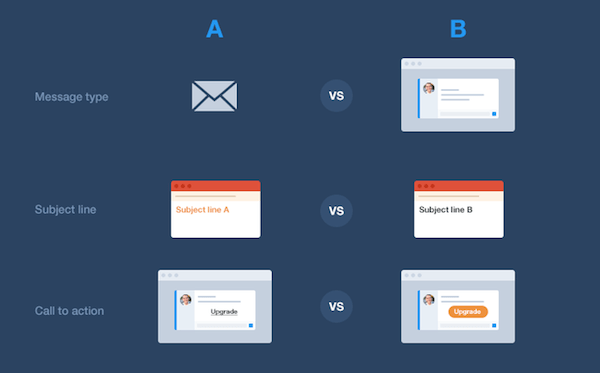 Intercom now let’s you create two variations of an auto message to test the impact of different elements of your message. For example you could test whether a personable in-app message with a simple text link (Version B below) will drive more users to a particular resource that you know will help them be more successful in performing their job. In our experience, it will. Compare opens, clicks, and goals. It’s easy to compare the performance of your message variants side-by-side – open rate, click rate, goal conversions, and more. When you’re comfortable you have enough evidence to make an informed decision, select the winning message and begin sending it to 100% of the target recipients. Refine and iterate over time. Nothing is ever perfect. While there can only be one winner for each test, there’s no limit to the number of tests you can run. It’s a good practice to constantly improve upon the winning variants of past tests by running new tests. Always be testing. Don’t take our word for it. Take twoodo’s. The team at twoodo, a collaboration tool that helps teams organize themselves using simple #hashtags, use Intercom to communicate with, onboard, and ultimately retain their users. They’ve been using Intercom’s new A/B testing functionality for a few weeks now and have seen some incredible success. 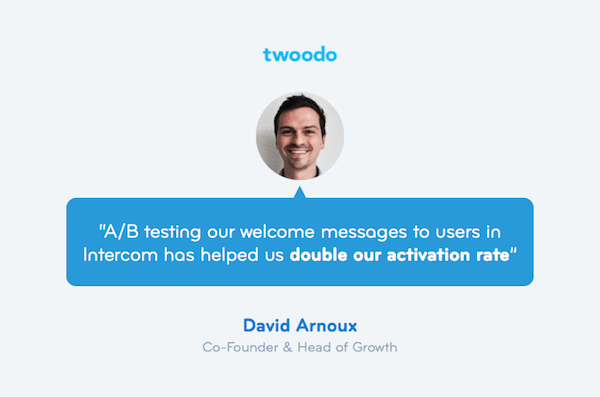 Intercom made it easy for the growth team at twoodo to compose and automatically send a series of 8 welcome emails to new users over a period of 45 days. Thanks to Intercom’s user filters, they are able to segment their users into one of three segments based on their usage, or “level of activation”, in the product. This allows twoodo to send different types of content – educational, aspirational, and personal – to each segment of users as they each have different needs and motivations. Thanks to A/B testing, the team at twoodo have been able to run tests and optimize each message for each segment to drive increased user activations. One vs many? One wins. 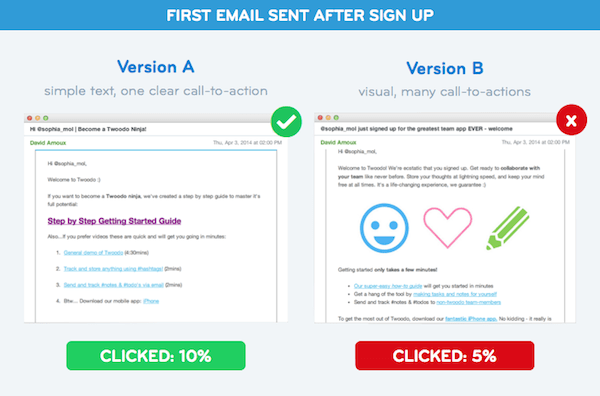 A particularly successful A/B test twoodo ran was on the content of the first email a user post sign up. The simple change led to a doubling of the click-through rate. Nice one. 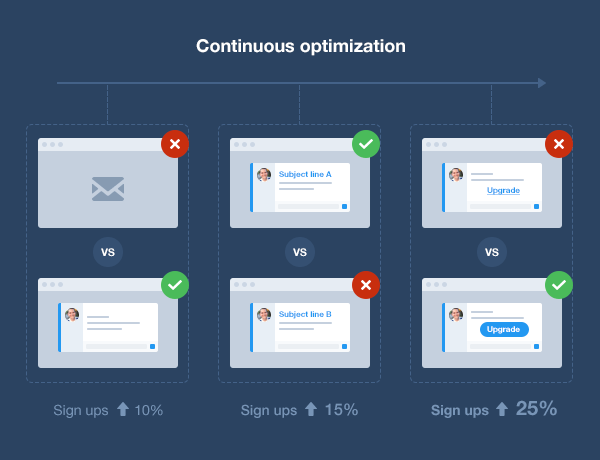 Like twoodo, you too can start sending the best messages to your users with Intercom’s powerful combination of user segments, auto messaging, and A/B testing. 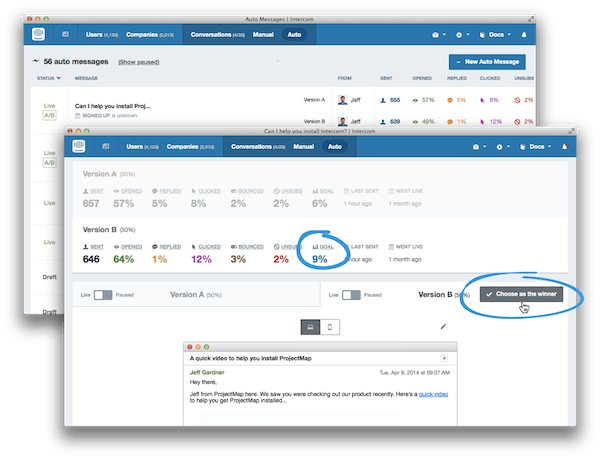 Start using Intercom today and increase user engagement, conversion and retention by sending automated, timely, and personal messages to onboard, communicate, and get feedback from users. We’re confident that like David you too will start seeing the benefits of A/B testing your auto messages in Intercom, but we know there’s lots more we can do to help you run smarter tests and send even more effective messages. Any time you are using Intercom you can send us a message and tell us how we can improve A/B testing for you and your team. A big thanks to the team behind the scenes of A/B testing – Colin (Product manager), Gustavs (Product designer), ShekMan (Product designer), Peter (Engineer), and Mark (Engineer). They’d love your feedback. UPDATE: Since writing this post, our messaging features have improved a lot. However, one feature mentioned in this post, the ability to test in-app versus email, has since been retired.